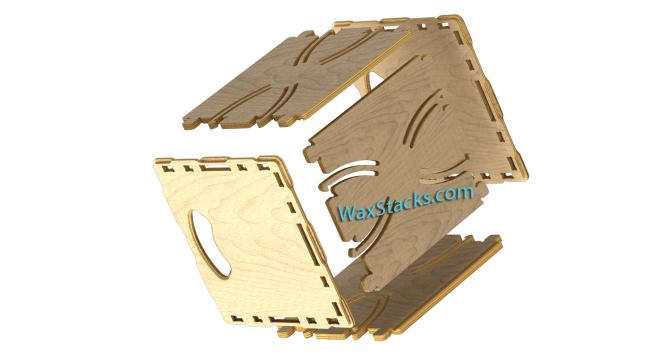 Patented tool-less assembly, Stackable and Rackable, Protect your investment! Patented tool-less assembly & knock down: No gimmicky hardware or tools required to store ten or ten thousand records. “Stackable and Rackable” Innovative lap joint allows for mix & match book case style or long term storage style stacking. The best part is you can mix and match to suit your needs as your collection changes. Transportable: The only record storage and display solution that allows you to simply grab a bunch of albums and hit the road without risking damage. All edges are protected and held properly. Eco friendly in every way: Sustainable harvest Baltic Birch logs come to the west coast and then an all domestic production process allows for small batch customization and guaranteed processes and performance to minimize waste. Unique finishing provides exotic hardwood look without decimating hardwood forests. Packaging is 100% recycled paper. Design allows for maximum efficiency flat pack shipping. Your vinyl deserves a great home; Protect your investment!